Iowa Gov. 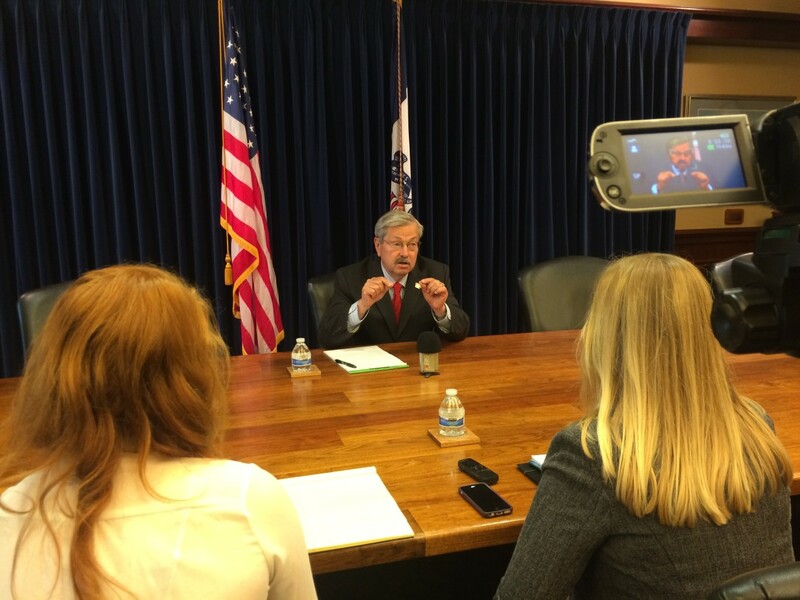 Terry Branstad in a July 7, 2015, interview with IowaWatch summer 2015 intern reporters Clare McCarthy (left) and Makayla Tendall. 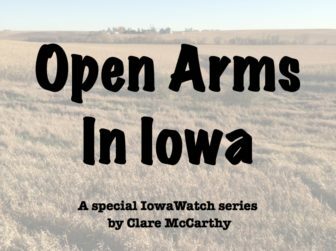 Jeanne Buck Coburn, a Mary Kay Cosmetics sales director living in Waterloo, Iowa, contacted former IowaWatch intern Clare McCarthy after reading McCarthy’s Aug. 5, 2015, story Response To Refugees In Iowa Has Changed In 40 Years because two Iowans featured in a photo with the story are her parents. Coburn told of how her parents took in the Nguyen family, refugees from Vietnam in the 1970s who moved to Iowa after the war in their country ended. Coburn helped McCarthy contact Phat (Patrick) Nguyen, who wrote in a long email about his life in Iowa. One thing missing, though, was a girl he liked back home. They finally reunited in the United States in 2015. Next up for McCarthy was the interview with Iowa Gov. Terry Branstad and later story and photo that prompted Jeanne Buck Coburn to contact McCarthy. 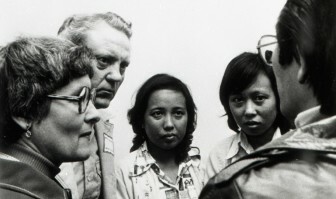 The Iowa Historical Society photo that prompted Jeanne Buck Coburn to contact McCarthy shows Vietnamese refugees in Des Moines with Coburn’s now diseased parents, Eleanor and Wayne Buck of rural Melbourne, Iowa. Gov. Terry Branstad seemed happy to meet fellow IowaWatch summer intern Makayla Tendall and me, welcoming us to the State Capitol building and asking us about our internships. The bristles of his graying mustache, which moved up and down as he talked, exaggerated his wide smile. Several formalities ensued—a brief introduction to the governor’s personal assistant, an opening of the complementary plastic water bottles that sat on coasters in front of us, a quiet question asking us if we were ready. Makayla went first, giving me another 15 minutes to read over my own questions and think about anything else I might want to add. After a quick thank you, the governor was swept from the room, guided out the door and suddenly gone. When Jeanne’s family went to pick up the refugees from Des Moines, they had to take two or three cars down to fit all of them. Jeanne and her younger sister rode in a car with their sister-in-law, who was driving, and they took the two daughters of the Nguyen family in their car. On the drive back to Melbourne, the two girls were extremely quiet, hardly speaking as they looked out at the new world around them. Although much older than Jeanne and her sister, they seemed suddenly younger, more naïve. After many months in a refugee camp, the bustling city atmosphere was somewhat overwhelming for them, entirely different from that to which they had grown accustomed. They kept looking back over their shoulders through the rear window, their eyes searching for the other cars that held the rest of their family. 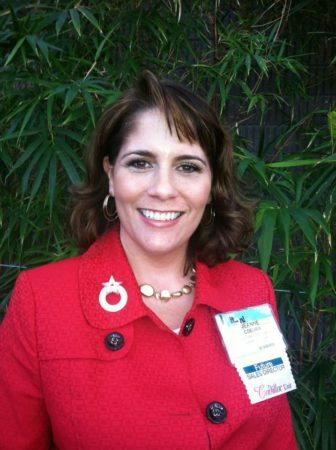 “It wasn’t until much later that they explained to us that they were afraid we were going to separate them and take them to different places,” Jeanne said in our second interview. “That’s why they kept watching the other cars behind them to make sure that they were all together. Which, you know, kind of highlighted the amount of fear that they had. And they felt they had to trust us, they had no choice. But it was frightening for them I think,” said Jeanne. According to a Refugee Community Plan by the Des Moines Foundation, “Iowa’s refugee resettlement program has transformed greatly in the past four decades.” Increasing secondary migration, decreased federal funding, and higher need from refugees has led to more limited services and less refugee assistance, the report said. Those pushing for Iowa to do more for Burmese coming into the state point to Iowa’s history of welcoming refugees. When I asked Jeanne about how attitudes have shifted in comparison to the 1970s, she said much of it is still the same. “I do think that 9/11 changed people’s attitudes a lot, it made them more fearful. The world has gotten a lot smaller. Definitely, there was ethnocentrism and bigotry then, and that was probably my first experience of that.” She even explained how she’s had to “un-friend” some people on Facebook lately due to their personal opinions on the current refugee crisis. When the Nguyen family first arrived in the United States, none of them knew how to drive a car because they had grown up in a city with mass transit and public transportation. So Jeanne’s father worked with the family to teach them how to drive, riding with each of them as they drove back and forth on the gravel road near the Nguyen’s house. At times, they would press down too hard on the gas pedal, causing dust to fly up in big billows behind them, Jeanne’s father shouting in a flustered panic. Jeanne’s cousin lived nearby, and each time they passed by his house, they would see him out in the barnyard and turn to wave as they drove. With every wave, their heads would turn and their hands would swerve in that direction, causing Jeanne’s father to grab the wheel in haste to correct them. They would laugh hysterically as the car bumped along the gravel road, their eyes shining as they looked to Jeanne’s father, huddled in the passenger seat as he clutched the handle on the door. Gov. Branstad is not alone in believing the United States should close its doors to incoming Syrian refugees. Over half the nation’s governors oppose acceptance of Syrian refugees within their states, despite Syrian refugees being the largest number of refugees in the world. Saigon had fallen and Vietnamese refugees needed a new home. Iowa opened its arms in the 1970s. A former IowaWatch reporter’s story rekindled memories for one Iowan whose family took in some of those refugees. 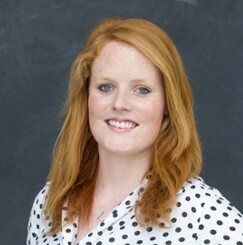 This five-part series by Clare McCarthy tells that story.